Lengths Available: 18", 24", 30", 36", 42", 48"
A street sign is a type of traffic sign used to identify named roads, generally those that do not qualify as expressways or highways. 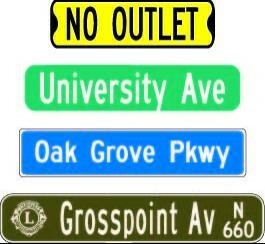 Street signs are most often found posted at intersections, and are usually in perpendicularly oriented pairs identifying each of the crossing streets. Modern street signs are mounted on either utility poles or smaller purpose-made sign poles posted on a streetcorner, or hung over intersections from overhead supports like wires or pylons.